Scott Mercier: Do bikes change lives? Yamel, a seventh grader in Carbondale, has used cycling as a way to overcome personal hardships. One of my core tenets is that bikes change lives. And I mean that literally; the arc of my life has been immeasurably changed by the bike. Not just from the time in the saddle, although in that manner too, but also from the people I’ve met and the places the bike has taken me. But few stories can compare to that of Yamel, a 12-year-old seventh-grader in Carbondale. She’s from Guerrero, Mexico, and has lived in Colorado for just over a year. Yamel’s life is hard. She is being raised by her dad, Freddy. Her mother had to take her three brothers back to Mexico because her baby brother Andy was born last year with a medical condition. Her mom and two of her brothers are not able to return to the U.S.
Yamel is here legally, but her family has been torn asunder. She spends a lot of time alone because her dad works long days to support the family. Her dad’s love for her is evident, however, in the time he takes to make her a special lunch every day; they’re legendary at the school. I could see the sadness in her eyes as she spoke about her mother and her baby brother. She misses them. She stayed in the U.S. to learn English, and to have more opportunities. When she grows up she wants to be a doctor so that she can cure her brother and other sick people. Yamel learned to ride a bike when she was 5. Her uncle taught her in Mexico. She wanted to ride when she first came to America, but she didn’t have a bike or helmet, and her family didn’t have the spare funds to buy her one. This year, her desire to ride came to the attention of Sara Porter, a teacher and coach at Carbondale Middle School. 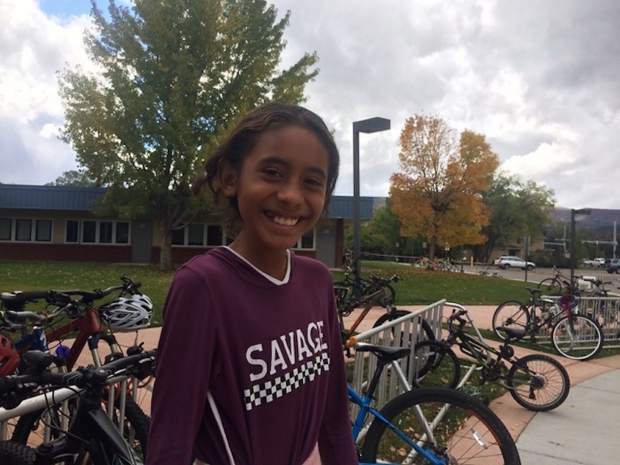 Sara asked Jon Delk, of the newly formed Roaring Fork Cycling Club, whose vision statement is “To empower youth through cycling,” if he and the club could help. Jon had a new bike that had been donated by Marylyn Bondlaw and Annie Gonzales that was in need of a rider. It was a kids’ bike, and it was just Yamel’s size. But Jon attached a condition: she’d have to earn the bike by participating in every practice after school for five weeks. If she could do that, the bike was hers to keep. She didn’t miss a single practice! When I asked Yamel about riding a bike, her face lit up in a huge smile. She said riding a bike is her favorite thing to do. She rides because it makes her mom and dad proud, and it gives her a sense of independence and freedom. Last year, Yamel would walk home from school and wait in her room for her dad to come home from work. This year, he would pick her up at 5:45 after practice, and they’d ride home together. The two of them also ride the pump track together in Carbondale. Her dad is cautious, but she likes to get air, bigger air than her dad, and ride wheelies. I could see from her sly smile that she likes being better than her dad. She was humble about it, but also proud of herself. She has the lean physique of a top-level cyclist. I asked if she had ambitions of racing, but at this point she just likes to ride for fun. Quite frankly, that is exactly what she should be doing. Yamel doesn’t have many friends in Carbondale yet, but when she is with the team, she really feels like she’s part of the school and the community. She feels like she fits in. Most of the kids and coaches don’t speak Spanish, so it forces her to learn and practice her English, as well. She said she also likes to ride after a bad day. It makes her feel stronger, both physically and mentally. She thinks about her mom and little brother when she rides, and that makes her happy. In fact, she said that the happiest parts of her day are when she rides her bike. By this point, I was struggling to hold back my tears. As I left the school, I was thinking of deep, philosophical questions, but I kept coming back to the bike, and what it means to Yamel. Bikes do indeed change lives. Scott Mercier represented Team USA at the 1992 Olympic Games and had a five-year professional career with Saturn Cycling and The U.S. Postal Services teams. He currently works as a financial adviser in Aspen and can be reached at scottmercier24@gmail.com.